1. Cry-Baby the Musical at Silhouette Stages. 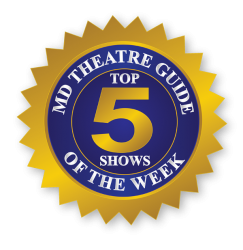 “…an extraordinarily executed, gorgeously costumed production.” – Steve Charing. Synopsis: Cry Baby: The Musical – It’s 1954 and Wade “Cry Baby” Walker is the coolest boy in Baltimore. He’s a bad boy with a good cause – truth, justice and the pursuit of rock and roll. Cry Baby and the square, rich girl, Allison, are star-crossed lovers at the center of this world. Fueled by hormones and the new rhythms of rock and roll, she turns her back on her squeaky clean boyfriend, Baldwin, to become a “drape” (a Baltimore juvenile delinquent) and Cry Baby’s moll. It’s Romeo and Juliet meets High School Hellcats. This jumping, jiving Tony nominated musical, based on the cult classic 1990 John Waters film, is pure entertainment! 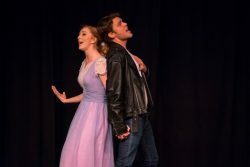 Lindsey Litka as Allison and Michael Nugent as ‘Cry Baby.’ Photo by Stasia Steuart Photography. 2. I’ll Get You Back Again at Round House Theatre. “If you’re not afraid to look in the mirror, “I’ll Get You Back Again” is for you…one of the most compelling shows on the scene for this October.” – Andrew Walker White. Synopsis: Chloe is a struggling stand-up comedian – until she decides to sit in for her dead father as the bassist for his seminal psychedelic rock band. While the band plays on and old tensions rise, Chloe must navigate memory, history, and the lessons we’ve learned from the Sixties. Written by Sarah Gancher and directed by Tony nominee Rachel Chavkin (Broadway’s Natasha, Pierre & the Great Comet of 1812) comes a high-energy rock & roll comedy with live music you don’t want to miss! 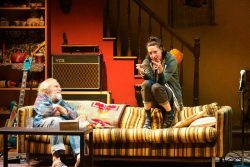 David Patrick Kelly (Carl) and Renata Friedman (Chloe) in ‘I’ll Get You Back Again’ at Round House Theatre. Photo by Kaley Etzkorn. 3. The Adventures of Peter Pan at Synetic Theater. “With minimal effects and simple staging, much of the magic of Peter Pan is left to the imagination – with the help of the talented cast and crew.” – Maria Elharaoui. Synopsis: Take flight to Neverland with Peter Pan, his Lost Boys and the Darling children! 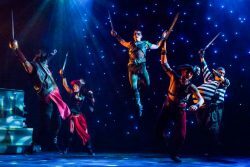 In this magical place filled with fairies, pirates, and mermaids, Peter Pan and crew will battle the delightfully sinister Captain Hook with acrobatics that will leave you on the edge of your seat! This production is recommended for ages 7+ for moments younger viewers may find frightening. The cast of “The Adventures of Peter Pan.” Photo by Johnny Shryock and Brittany Diliberto. 4. Intimate Apparel at Everyman Theatre. “…this very intimate peek is a guaranteed pleasurable night out. ” – April Forrer. Synopsis: Wearing her heart on her sleeve while sewing intimates for her clientele, Esther is the talented African American seamstress in turn-of-the-century New York who has built a savings for herself making beautiful undergarments—while earnestly daydreaming of new beginnings, romantic possibilities, and the lingering affection she shares with a Jewish fabric merchant. But when an egregious deception cuts short heartfelt desires, can class, culture and circumstance outmatch the strength of human spirit? 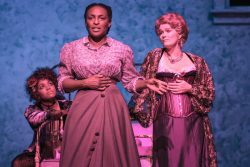 Inspired by a true story, Intimate Apparel is a heart-rending contemporary work in the style of an enduring classic—from the first female playwright to win two Pulitzers. l-r: Jade Wheeler, Dawn Ursula and Beth Hylton. Photo by Clinton B Photography. 5. Aida by Reston Community Players at Reston Community Center. 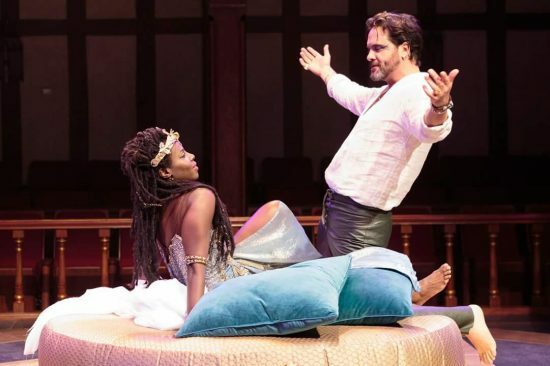 “Reston’s production of ‘Aida’ captures the depth of this timeless love story with passionate dance numbers and heart wrenching harmonies that leave you waiting for the next romantic duet.” – David and Jena Jones. Synopsis: Suggested by the Verdi opera, Elton John and Tim Rice put their spin on this timeless love story. We are transported from a museum exhibit to ancient Egypt, where Radames, the commander of the army, has claimed new turf in neighboring Nubia, along with a batch of new slaves; including Aida, who captures his interest – and his heart, despite his betrothal to the Pharaoh’s daughter Amneris. Sent to work in the palace as one of Amneris’ attendants, Aida keeps secret that she is the Nubian king’s daughter. Things escalate when the Nubian king is captured and Aida, Radames and Amneris face choices that will affect their lives, loyalties and loves. 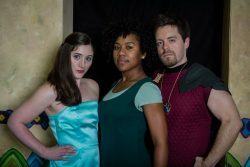 Claire O’Brien Jeffrey as Amneris, Tara Yates-Reeves as AIDA, and Brett Harwood as Radames. Photograph by Jennifer Heffner.